SO, how do you feel about tweed jackets? Here to stay, or should have stayed in the past? Let me know in the comments below! Love the outfit as always and I definitely remember a time when Tweed was considered as the grandma style jacket, I have to say I've always liked it a lot, but I'm still glad it is coming back, it means that I can wear some without the odd looks! I still think it is grandma and the only persins that can pull it off are beautiful young lasses as you are one. I'd just feel old. You look beyond chic with this outfit! 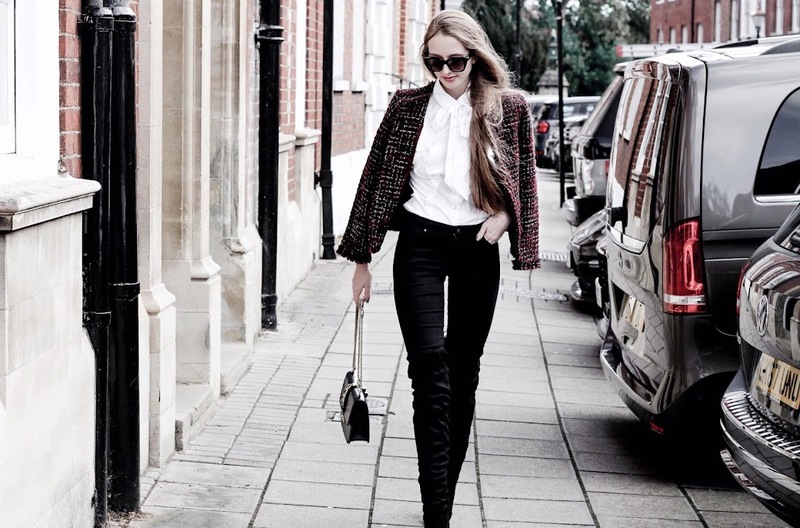 Tweed jackets definitely elevate any outfit! Wellllllll this jacket is so V Chanel-esque I can't even! <3 Also how pretty is the heel detailing on those boots?! Yet another outfit you've absolutely nailed lovely! I would love to own a Tweed Jacket! ❤️ It's so much in trend right now! And I love those boots! Very well styled! You look fabulous honey! Love your outfit so classic and chic! Such an elegant look! Love the heels of the boots. This jacket is so cute! And it matches perfectly to your hair! Great Look cutie! wow! Your jacket look amazing <3 Great look! I love the outfit. Looks so good! I will definitely google those boots! I've seen so many people wearing this jackets right now! I went and ordered myself one today! Lovely photos this outfit looks amazing on you! I love your look & these photos. You look so pretty. Tweed jackets are so classy and stylish. Gotta love em!! I love the styling here. You look amazing Gabrielle dear. I agree, tweed jackets can cover every single occasion from work days to dinner dates. That's why, it's good to stock up 😁 You look FAB! I love the heel detail of your over the knee boots. 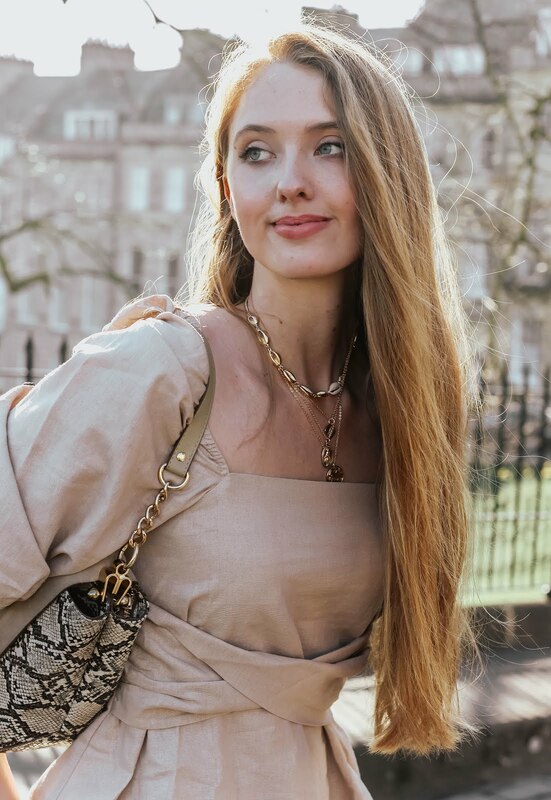 I'll admit that tweed is definitely an area I've been too afraid to go but reading this post, you've convinced me how wearable it really is! You're definitely rocking it and lets just say - I'm sold! I've always loved tweed jackets! I'm a classic girl at heart. They always pull an outfit together. They are a statement piece. You pull this look off SO well! You definitely have me convinced that they're trend that stays, but I'm not sure I'd be able to rock it myself. I think I'd need you there to help style me! I love tweed on you! and those boots are just stunning :) I unfortunately live in a tropical country so this fabric is out of the question for me. Here to stay! I've been loving tweed so much lately, and you pull off the material perfectly! This look is so chic, and the jacket is the perfect finishing touch. Hope you had a lovely weekend Gabrielle! I love a good tweed jacket - it's just so classic, isn't it. Definitely livens up my fave combo of a white shirt and jeans look as well! That's perfect fall outfit!! I like this look very much! Just lovin your red tweed blazer with your high black boots! SOOOO incredible! Sooo chic and rock n' roll at the same time! That's so not the type of jacket I think of when I hear tweet! It's lovey. Ooh really loving this jacket! What a beautiful tweed jacket and wonderful pictures too, you've definitely inspired me to wear mine today!! That jacket and those boots such a brillante combo! very nice and elegant outfit ! I think tweed will always be a classic! And just recently had to have a bit of a clearout as I'd accumulated far too many tweed jackets, haha! :) I only have a couple now, this is a good reminder to myself to get them out for a wear again! :) You look beautiful in yours, I love pairing them with denim. Hope you had a great weekend :) We went to a theme park, a nice way to relax after a stressful sick-filled week! You look super elegant as always - those boots are incredible! I do love a bit of tweed, I think it's such a classic! I always love tweed jackets, but wearing it in tropical country such Indonesia might not be a good idea. Cute jacket, but let's talk about those boots - they're adorable, especially the heels. This blazer is an all-times classic, which is simply perfect! I see we share our current love for tweed. Personally, I would even say that my love so far never stopped and therefore I adore your jacket that you combined in a perfect way! Love this Chanel-esque look. You look stunning. So classic and chic! I love the tweed! I love that jacket! It's so pretty and classic. Oh I’m feelin’ it! And you pulled off the look! 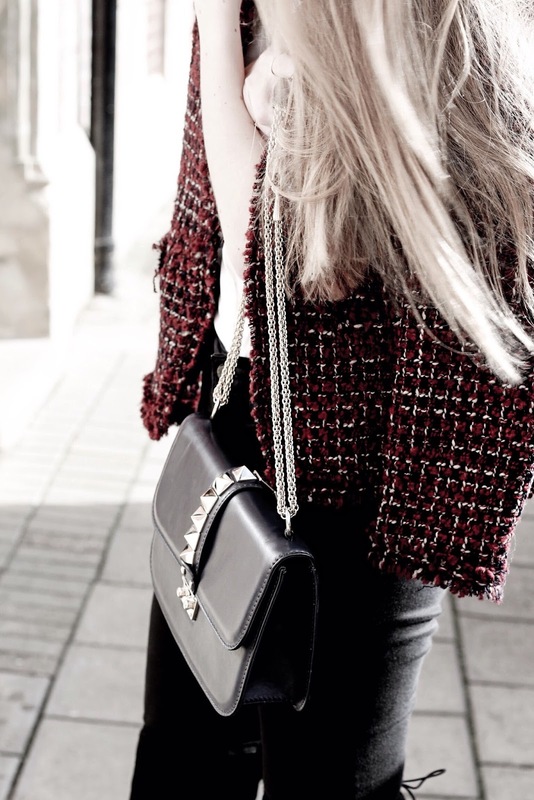 This tweed jacket is so chic ! 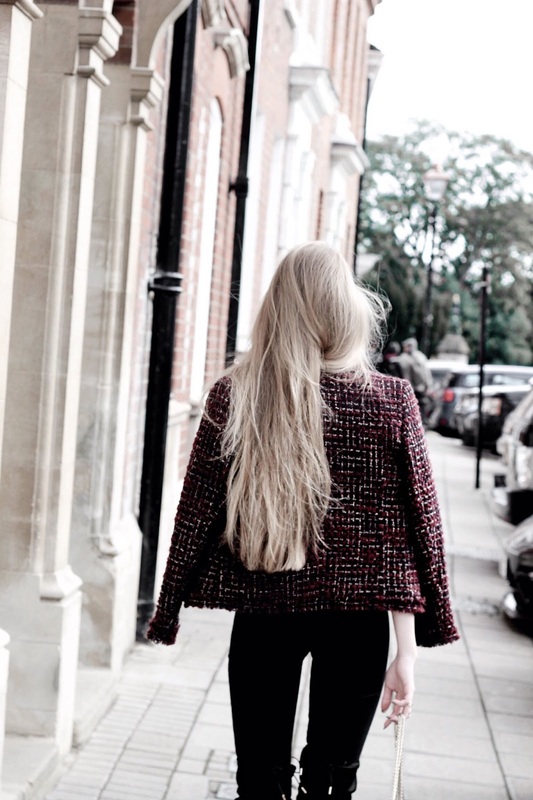 Obsessed with this tweed jacket on you!! Looks soooo chic! you look amazing. Love this classy and yet casual look. I love this look! You are soo classy! I love the idea of just draping the jacket over your shoulders, especially if the jacket is on the larger side, which for me, it always is! Thanks for the ideas!! I like a lot tweed jacket if very well combined, as you did! They can add a classy touch to a edgy or casual look! You look wonderful Gabrielle! Love your entire outfit, and the pics are amazing! i think tweed is so cute actually! it's kind of like a subtle statement piece that can be worn almost anywhere with anything and it'll still look good. 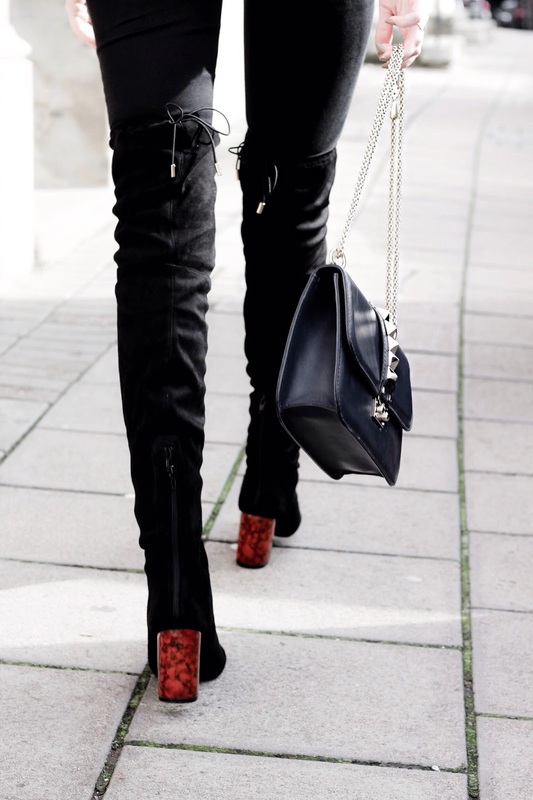 loving the accent heel on your boots, btw! That tweed jacket is so chic! I love that it matches the heel of your boots! Your boots are the perfect shoes for this look! Love the unique tortoise shell heel, an excellent compliment to the burgundy tweed jacket! 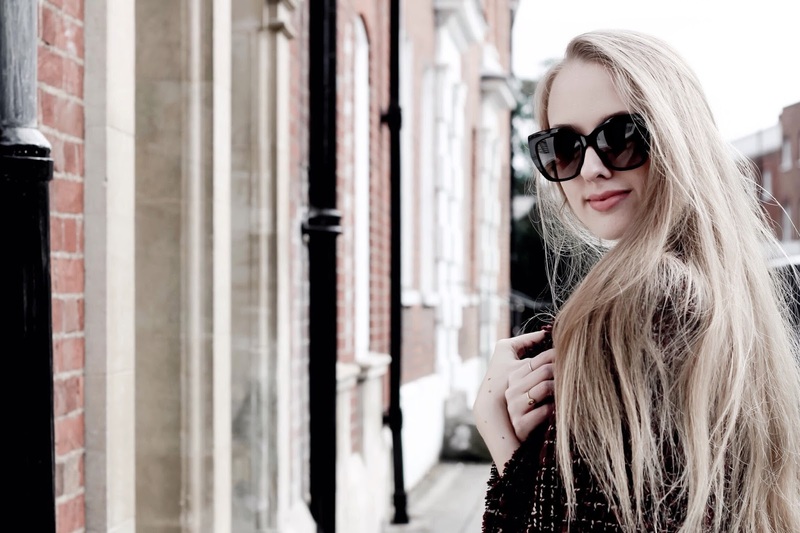 There's something elegant about a tweed jacket. I personally think it has to stay, it elevates ones look, makes jeans suddenly become less casual. I love your burgundy jacket and the boots together, the colour matching is clever and pretty. Um this is literally one of my favourite outfits on you ever, you look so good! It's funny you mentioned Clueless as well because I was watching that the other day and I actually found it shocking how much of the clothes in that movie were things I'd pretty much seen available now in places like Topshop! 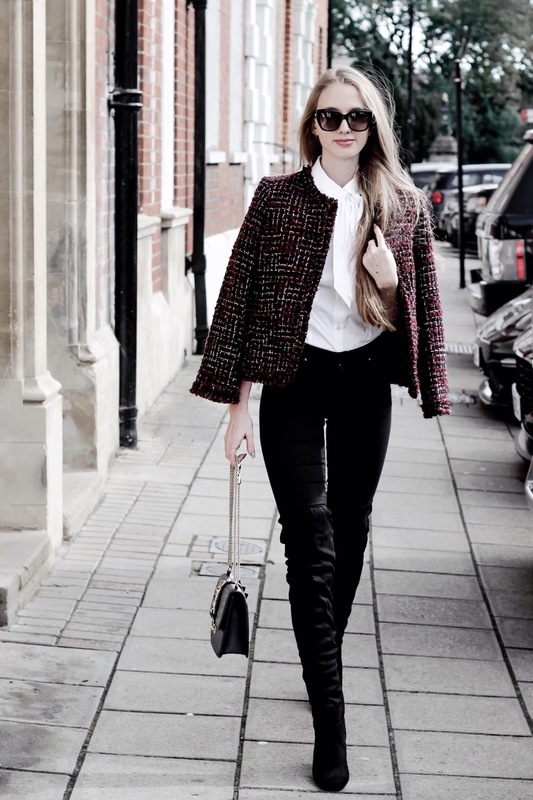 You look SO chic, I love tweed jackets ! I LOVE tweed jackets. I have quite a few myself haha. I love this jacket that you wear and the velvet jeans are amazing! Have great day! A tweed jacket is definitely old school, a classic piece :) Also I love your boots. This tweet jacket suits you beautifully Gabrielle, you look so chic in these photographs and as always you've styled up your look so perfectly. The red heel of the boots match the warmth of the colours in the jacket very nicely, and your sunnies add such a wonderful finishing touch. Thanks for sharing and wishing you a Happy Friday! Amazing outfit dear, love the jacket and boots! Never knew tweed had a bad rep ! I love them and like you think they work for many occasions. Your tweed piece is outstanding.